This book explains (and illustrates) what happens as the seasons change to the ocean and the animals and plants living there. It also includes a full summary for each season in the back and food web cards.I rated this book 3 stars because although the back contains some great content, I didn't feel as though the book flowed that well. The illustrations were wonderful, but I didn't feel as though it was much of a story. I mean even sciencey books usually tell a story right? I think there could have been more transitions with this one.I would use this book to teach about how the ocean changes with the seasons. I would love the food web cards in the back of the book and the summary of the changes for the seasons too. I think some of the vocabulary would be over elementary students heads, so it might not be an independent level book. This book discusses the seasons of the sea - just as the land surface of the Earth has seasons, so does the sea. Plants and animals throughout this book are presented with interesting facts about the ocean. This would be a great book for ages preschool through elementary. The incorporation of math in the story line adds interest and depth to the value of this lovely book.The illustrations are colorful with gently flowing lines and coloration and will keep the reader intrigued. The text is engaging and lyrical.The back of the book contains information to help with educational pursuit of ocean ecology in the way of little tear-out cards (which can be copied or also downloaded from the website). Information on the seasons of life, food chain of life, and also yearly seasons is fleshed out for use as an add-in for curriculum, great for libraries, super for pre-beach trips. Further value is afforded by Arbordale with the reading and math quizzes provided on the website here and also here.I recommend this book for any younger child who loves the ocean and wants to learn more about what is under the sea.DISCLOSURE: A complimentary copy was provided by Arbordale to facilitate this review. Opinions expressed are our own. I was originally going to give this book 3 stars, but on looking it over again I think it's a 4 star.The book shows the different seasons in the ocean (hey, I wonder if that's how they came up with the title?) We see changes in animals and plants. The book also shows the food chain in a gentle manner. At the end of the book there are 'food chain cards' you can photocopy or download from their website to practice putting together food chains. There is also some 'scientific information' at the end which further explains some of the topics the book briefly covers.The illustrations are very nice. The text is simple. Without the information in the back it's a 3 star. But if you use the additional stuff I think the book increases in value.I'd use this mostly for understanding the ocean food chain, not so much the 'seasons of the ocean.' Could be used up through 3rd or 4th grade. The nearly 3 year old "marine biologist" loved this book. He kept telling me what all the illustrations represented and wanted to know more about them. Of course tomorrow when we read "All about the stars" (or something similiar) the inner "astronomy fanatic" will shine through and we'll be talking about Saturn's rings until the sun goes down. Today though it was all about kelp and coral. This book has no awards but was a finalist in many nominations. It is good for ages 4-9. 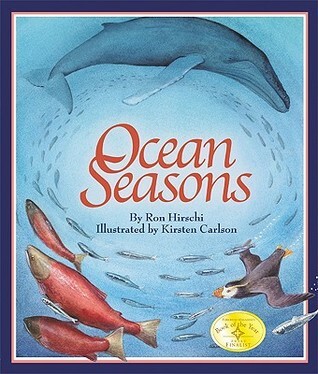 This book mentions not only seasons in the ocean, but also different animals in the ocean and different ocean names. It also tells us how the animals survive under the water and what they eat. It even goes into the ideas of hibernation and uses vocabulary such as north, east, west, and south. The ocean food web and food web cards in the back of the book are an easy way to access an organized summary of everything that the ocean involves! The illustrations made it very clear to depict which season it was. The book was full of very interesting and elaborate vocabulary that would most likely be new to students. One in class used could be to choose one ocean animal to do research on. Another in class use could be to create our own classroom's "food web".